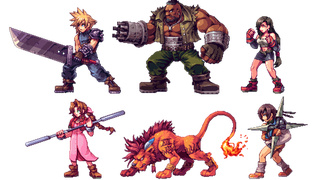 Daniel "Abysswolf" Oliver's pixel art reminds me of the Metal Slug games, especially Barret's look in the Final Fantasy VII piece above. But he's mostly into JRPGs and recently, he remade the cast of a couple of classic games as detailed, colorful 2D sprites. There's much more on his Tumblr and DeviantART pages. I'd love to see the cast of Final Fantasy VI remade similarly. They always looked so pixelated.